Tea cozy (USA) or cosy (UK)? Either way it’s spelled, cozies have a firm place in the tea-loving home & add a lot of personal style to the setting. Growing up, we never used one, though my mom was known to brew a pot of tea now & again. But cozies were mentioned in the historical fiction romances I practically inhaled. Thus, it seemed to me the proper way to cross a tea. It is said that when the Duchess of Bedford made afternoon tea fashionable in 1840, she probably also introduced the cozy or tea warmer to insulate the pot. However, its use was not documented until 1867. Still, I wondered what kind of cozy the Duchess used for her intimate tea parties? Did they match her dress? Her mood that day? In these modern times, one can find myriad cozies fashioned to look like animals, beehives, cottages, cupcakes or even a bouquet of flowers. A posy cozy? They might made from any sort of fabric: brocade, velvet, wool, linen, cotton, patchwork, or felt. Or knitted from sturdy yarn to fit like a wee hat over the pot. When I see one of those, I remember Dobby, the house elf, who wore a tea cozy hat in the Harry Potter books. Still, I had no desire for a cozy for my teapot…until…I saw a Martha Stewart video online, “How to Make a Tea Cozy.” Monogrammed, no less. It was elegant & it was Martha. I filed the cozy idea in my mental filing cabinet & flagged it. When I took afternoon tea at my friend’s house, I noted her red transferware pot covered with a cozy out of something linen rich, one side decorated in needlepoint. Gorgeous! Plus, it really did keep the tea hot. And…did I mention it was gorgeous? My friend tried to remember which site she had ordered it from – a store in Bath, England? We couldn’t find the link. Now, I was on a cozy quest. I haunted Etsy & eBay, my usual hot-spots, putting several choices on my “Watch” page. Though hearting other pretties, none were quite right. After the needlepoint cozy, my standard was too high. Then I found some charmers on eBay, handmade out of vintage materials. One of white linen with antique trims. One cut out of an old Christmas table cloth. The last crafted from vintage tapestry material depicting a genteel scene with two ladies & a gentleman caller. What bounty! How could I decide between them? Linen Cozy w/Antigue Trim, sitting behind two Chintz cups & saucers. Cute Christmas Cozy with red & white china cup & saucer. I couldn’t. I bought them all, secretly assuring myself that one or more would be a gift for another tea-taking fan. But will that actually happen? My favorite! A tea cozy handmade from old tapestry fabric with ladies & gentleman. Shhh. That’s still a cozy secret. Would you believe me if I told you I love to pay bills? Truly, I do! But there was a time I dreaded the job. That is, until my friend told me about a book on how to make it a delightful event. What? How could that be? Still, since Barbara seemed always bathed in beauty, giving every situation a splash of loveliness, I wanted to know her secret. So I bought my own copy. Written by Alexandra Stoddard, the book was titled Living a Beautiful Life. It made me look at hearth & home in a new way & helped me find beauty in the mundane. I haven’t seen that book for years though I know it’s in a box somewhere. My memories are sketchy after so long. Let’s see…a touch of yellow in every room? Hmm. But there was something I put into practice – paying my bills in a beautiful way. Making it a special time. Lovely note cards (or greeting cards) kept at-the-ready. Some of my note cards at-the-ready. Then it was time to put on the kettle & brew a cup of tea served to self in a gorgeous cup. Or pour coffee into a mug worthy of wonder. Didn’t hurt to have a couple cookies on a plate for a snack break. (All that math!) Or music in the background? A fragrant candle burning? In that lovely environment, paying bills was a pleasure. A treat to be enjoyed. Back then, it changed my world. My quest for loveliness in the bill-paying task has now morphed into the pleasure of keeping my word. Every time I use a service, like electricity from PG&E, I know it’s on loan from the company. Entrusted to me up-front until I reimburse them. When I do, I’m keeping my word & that makes me very happy. So this is my new style of paying bills. When it’s time, I set up my station rather like days of old. On the table to the right of my computer, an antique plate holds crispy toast covered with apricot jam. Nearby, a china cup is filled with steaming Cinnamon Spice Tea. The aromas tickle my nose & the radio plays softly in the background. I begin tap-tapping on the keyboard. These days I only pay a few bills by check, but I still use an elegant pen & pretty postage stamps. My current checks are charmers, though I feel a bit of a dinosaur when writing one out. Still, I sign with a flourish & love the wonderful feeling of keeping my beautiful word of honor. Taking another sip of tea, I smile at my accomplishment. NOTE: Living a Beautiful Life by Alexandra Stoddard remains in print & has been updated for changing times. Feeling Blue…Red, White & Blue! On a quick trip to the store to buy some graduation cards, I noticed an early display of July 4th holiday-ware. How could I not? Colorful clothing, picnic items, streamers, banners & bunting, all featuring the Stars & Stripes. A cornucopia of creative whatnots reaching out to rev up my patriotic heart. Of course, I began to plan. Now where was that recipe for Barbara Bush’s Red, White and Blue Cobbler? The one I – shhhh – shortcutted & made with canned cherry & blueberry pie filling? But the dish had scored at every potluck, served up warm with vanilla-bean ice cream. Made one’s taste buds stand at attention & salute. For the next bake, perhaps I’d tap my inner chef’s shoulder & use fresh ingredients. A longer process, but the effort ought to result in a higher-ranking of deliciousness. Right? I remembered our town’s tradition to set off our own fireworks. The night before the big 4th celebration in a nearby city, locals pack the stands at the fairgrounds in anticipation. The light show never fails to fill the sky with glory & uplift our spirits. As a bonus, the spectacle is easily seen from my own back yard. Just one requirement – a lawn chair. A Navy brat, my heart has always swelled at anything that highlights our nation’s history & fight for freedom here & abroad. Knowing of my military connection & pride in my dad’s service, my friend Georgina (Geo) & I had swapped stories of our father’s military service records. Her father – an Army veteran of WWII, Korea, & Vietnam & a Bronze Star recipient. My dad also served in WWII (a Pearl Harbor survivor) & the Korean War, & as a career Naval officer for twenty-seven years. Young John H. Elliott, who became an Enlisted Pilot during the war. Sailors standing at Parade Rest. 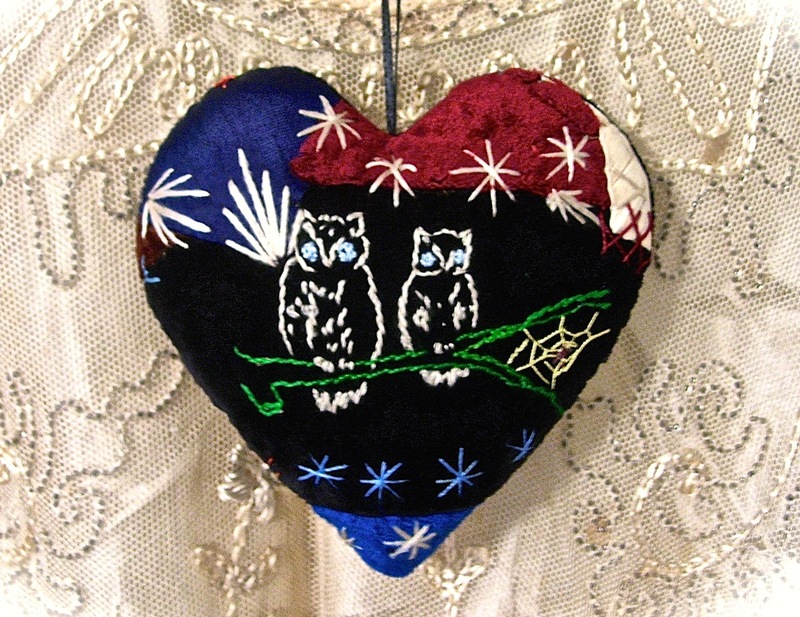 Geo, a master seamstress & crafter, had already created an exquisite heart with a simple anchor embroidered on one side, cut from an antique crazy-quilt. After the heart was sewn, she set it aside for a while. But once we’d chatted about our personal heroes, Geo finished it up & sent it my way. A surprise gift. Not until I received an email from Geo, “When I saw it (the heart) again the other day, it just spoke to me of your father being in the Navy…,” did I see the rest of the significance. On this 4th of July, I shall not only celebrate Independence Day, but also honor my dad by hanging the anchor heart in a prominent place as a tribute to those who have gone before. And as reminder to never give up hope. Thanks, Geo. Let freedom ring!